First OEB brought its brunch stylings to Edmonton, and now Calgary-based ice cream purveyor Made by Marcus is heading north. Made by Marcus branched out into a brick and mortar shop on 17th Avenue in 2016. They followed that success with a second location last year. Their product is currently available at some retailers in Edmonton, but a full-service parlour is a welcome addition to Old Strathcona. Look for it this summer, to be designed by local company Oliver Apt. It’s odd that they would choose April Fool’s Day to make this announcement, but Workshop Eatery shared that they’re behind the forthcoming burger shop The Woodshed, moving into the space formerly occupied by Solstice on 124 Street. Firecrust Pizzeria is opening another location, this time in the Meadows at 3820 17 Street. After 25 years in business, Manor Bistro closed their doors over the weekend. Culina is hosting a Ukrainian pop-up dinner in The Foundry Room, the second floor event space located above their forthcoming Culina To Go space in the Oliver Exchange building. The Mother’s Day event runs May 12, and tickets are priced at $45. Villa Bistro needs some work to create a more memorable experience, says Graham. Twyla was hoping for more restraint in Jang’s fusion menu. Crystal enjoyed her recent experience at Gregg Mediterranean in Sherwood Park. Congratulations to Kevin Kossowan, who has been nominated for a James Beard Foundation award for Visual and Technical Excellence, alongside Parts Unknown and Chef’s Table. Spoiler alert for the first episode of Top Chef Canada season 7: Edmonton’s first local contender, Alexei Boldireff of Baijiu, failed to make it into the main competition. Katy Ingraham of Cartago shared her view that the increased minimum wage is good for business. As Solstice has now closed, the chefs have moved on to The Almanac. What the Truck?! shared an update that they will no longer be organizing events, but will continue to promote food trucks online. Sharman recapped the latest Swine & Dine that took place at London Local. The City is considering expanding the urban hens project. It was nice to catch up with a friend over pasta at Uccellino last week. 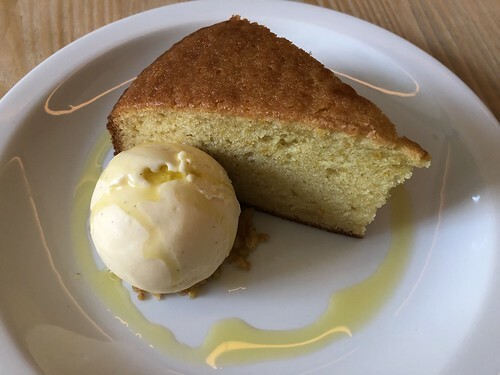 Even better, we ended our meal sharing our go-to dessert: the olive oil cake and olive oil gelato.